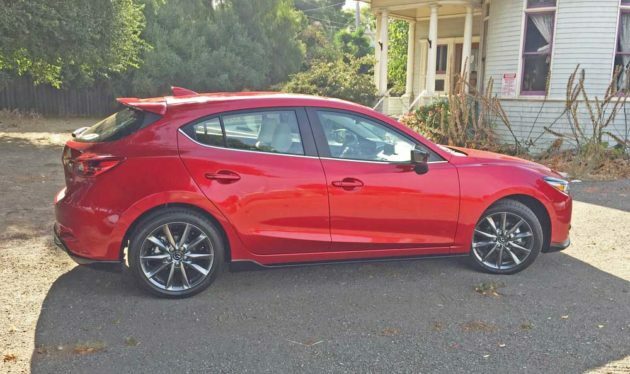 ?2018 Mazda3 Grand Touring 5-Door? The Mazda3 heads into 2018 with only subtle exterior modifications, but with new standard equipment and features as well as updated packages. The popular Mazda is still available in two body configurations ? a 4-door sedan and a 5-door hatch. There are also still two engine variants: a 2.0-liter 155 horsepower, 150 lb-ft of torque, SKYACTIV-G inline four-cylinder with standard G-Vectoring Control; and a 2.5-liter SKYACTIV-G inline four-cylinder that makes 184 horses along with 185 pound feet of torque. Available transmissions still consist of a SKYACTIV-MT 6-speed manual or a SKYACTIV-DRIVE 6-speed automatic. Drivers continue to be rewarded by Mazda?s Jinba Ittai philosophy?harmony between car and driver. The minor exterior modifications for 2018 elevate the Mazda3?s head-turning KODO?Soul of Motion design. The 2018 Mazda3 will be available in three levels of trim: Sport; Touring; and Grand Touring. 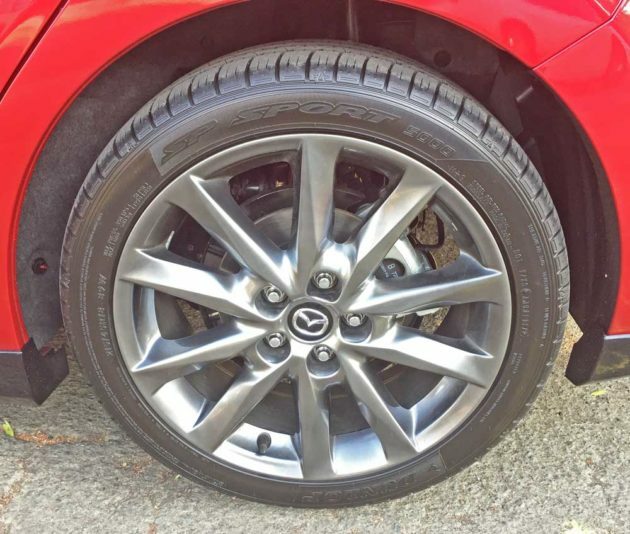 New standard fare for the 2018 model year includes: the addition of Smart City Brake Support; all Mazda3 Touring models are equipped with dark silver alloy wheels (new color); Overhead console with sunglasses holder and illuminated vanity mirrors (driver and passenger) standard on all Mazda3 Touring models; Bi-LED headlights with auto-leveling, LED combination tail lights and LED fog lights standard on top-trim Mazda3 Grand Touring models. 2018 Package upgrades include: a BOSE?/Moonroof/Satellite Radio Package reconfigured to include BOSE? 9-speaker audio system, SiriusXM satellite radio with 4-month subscription and moonroof (formerly part of Touring Popular Equipment Package); the Grand Touring Premium Equipment Package has been reconfigured to include High Beam Control, Lane Departure Warning System, Lane-Keep Assist, Mazda Radar Cruise Control, Smart Brake Support and Traffic Sign Recognition (all previously in separate Grand Touring i-ACTIVSENSE Safety Package). 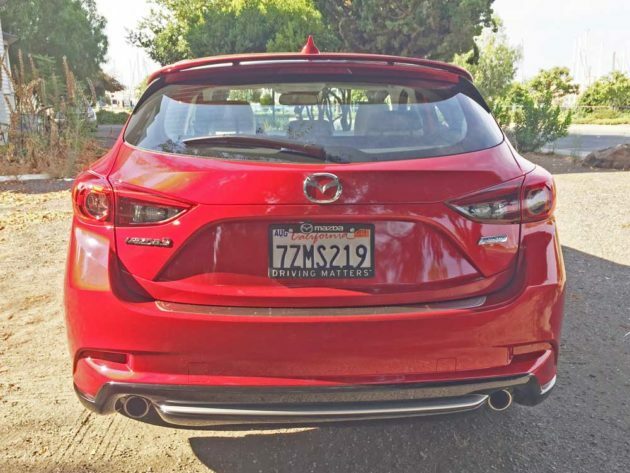 The 2018 Mazda3 is low and lean with a wheelbase of 106.3 inches, and while the sedan remains 0.6 inches shorter in overall length at 180.3 inches than the 5-door model. With a height of 57.3 inches and a width of 70.7 inches. 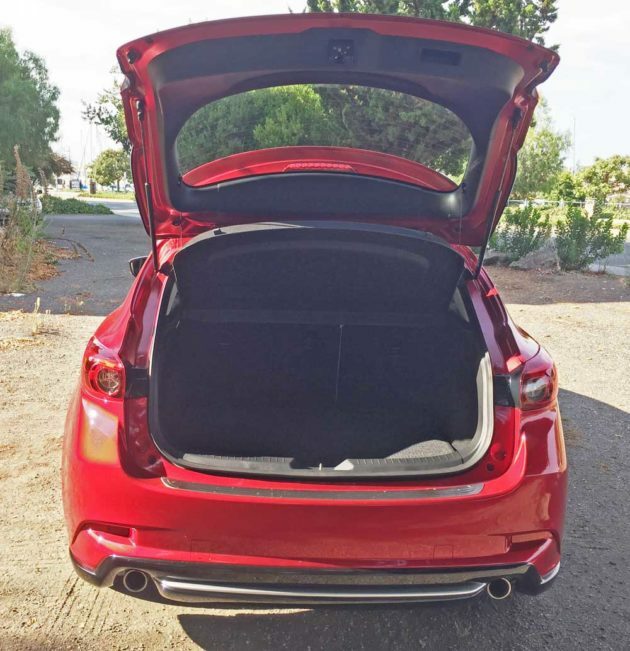 Last year the Mazda3 reduced its overall height by 0.6 inches, while gaining 1.6 inches in its pronounced, but toned hips, all while retaining similar headroom space and providing comfortable rear legroom. 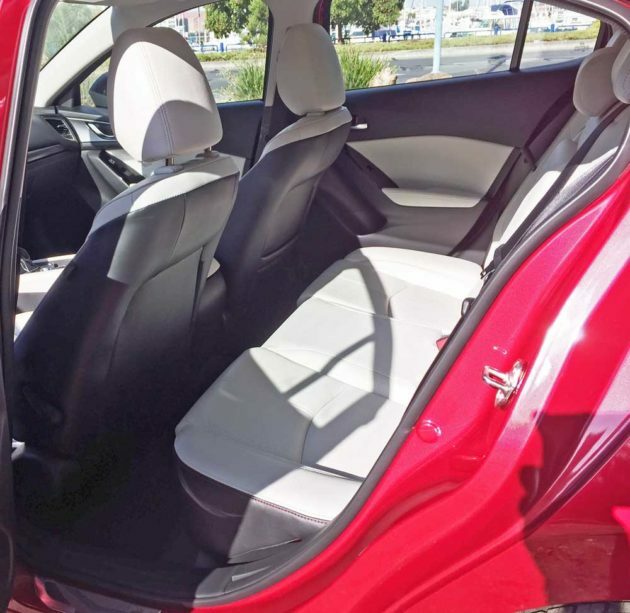 Rear seatbacks were lengthened nearly 2.0 inches for added passenger comfort. A rearview camera is standard fare for all models, and there are upgrade packages for specific models. The cab rearward posture of the vehicle and its highly aerodynamic profile projects its agility. The familial KODO design face creates a visual appeal from the dynamic signature wing of the five-point grille to the expansive hood cresting over sleekly slanted headlamps, and through the wide-stance muscular fenders that flex into taut character lines from panel to panel. Each chiseled feature serves a purpose, as both sedan and five-door models achieve a best-in-class coefficient of drag (Cd) at 0.255 and 0.28, respectively, when equipped with active grille shutters and i-ELOOP – a capacitor-based regenerative engine braking system for powering all of a vehicle?s electrical components. The active grille shutters mounted in front of the radiator, automatically open and close in accordance with driving conditions, improving aerodynamic performance while contributing to real-world gains in fuel economy. The interior matches the exterior in terms of expressiveness and purpose beginning with the driver-oriented cockpit, where everything from the arrangement of switches and knobs to the physical location of driving controls such as the shifter combine to enhance the driving experience. Pedals are symmetrically laid out to the left and right of the driver?s centerline for further precision and comfort. A hinged organ-type accelerator pedal is standard equipment for added safety while lessening the natural fatigue associated with frequent pedal pressure, such as during stop-and-go commutes. The A-pillars are set rearward, enhancing the range of vision for all occupants. Outside mirrors are mounted onto the doors instead of the industry-norm placement being at the base of the A-pillar post. Mazda?s Active Driving Display, which continues for 2018 first appeared on the Mazda3 in 2014. It is a clear pop-up panel that is vertically mounted behind the hood to provide vehicle speed, navigation directions and other pertinent driving information directly within the driver?s line of sight. The Active Driving Display automatically folds back into a hidden position when the ignition is shut off. The meter cluster features a centrally positioned analog gauge flanked by a pair of wing-shaped digital displays. A decorative dash panel outfitted in satin chrome with piano black trim pieces extends from the gauge clusters and adorns select areas of the center console and front door inserts. The seat architecture and materials also have been improved. Their structure focuses on comfort, space and weight without sacrificing support and feel. The driver?s seat cushion is large and the seat back is optimized, create a natural seating position. My test 2018 Mazda3 was a five-door model in Grand Touring trim, powered by the 2.5-liter SKYACTIVE-G four-cylinder engine, delivering power to the front wheels via the SKYACTIVE-Drive 6-speed automatic transmission. The exterior was finished in a Soul Red metallic, complemented by a Parchment and Charcoal-toned interior. The base price was set at $24,945 while optional features and equipment bumped the final price to $29,770. Options included: a Cargo mat; the metallic paint; a rear bumper guard; scuff plates and door sill trim plates; the Premium Package; and the Appearance Package, along with the Delivery, Processing and Handling Fee. 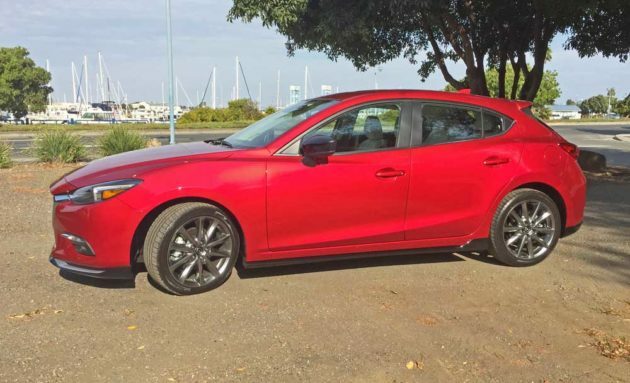 SUMMARY: The 2018 Mazda3 Grand Touring 5-door continues as a delight and stimulates the senses. 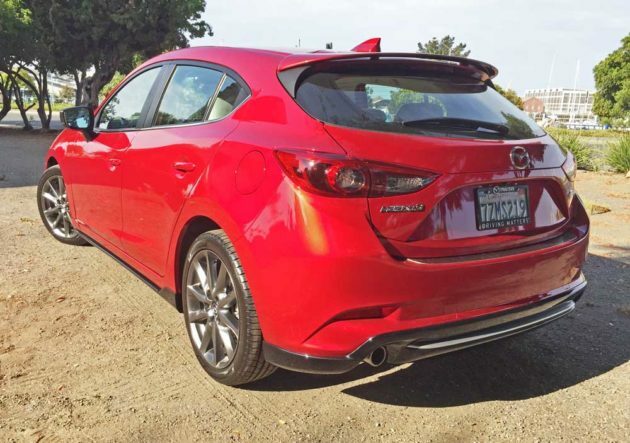 The Mazda3 was always fun to drive, with the 2.0-liter mill emitting an authoritative note, which some may relate to as ?buzzy?, but it?s anything but objectionable, while delivering more than adequate performance capabilities. The 2.5-liter engine obviously delivers more power without having to work as hard. All Mazda3 vehicles equipped with a SKYACTIV-Drive six-speed automatic transmission feature a manual shift option but the Sport mode feature adjusts the shift mapping ? and to a lesser extent the throttle response ? to better match more spirited driving conditions, such as challenging twisty roads. The transmission holds gears longer and doesn?t upshift or downshift as much while manually shifting when carving through turns. 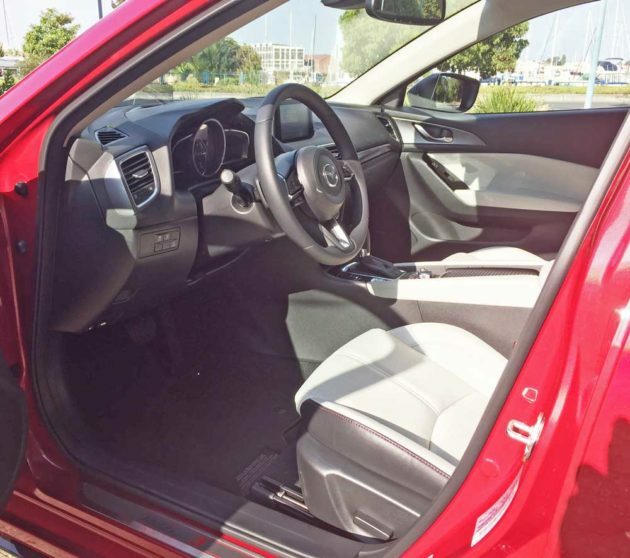 The Mazda3?s ride quality is very comfortable, neither too harsh nor too soft. There is however noticeable road noise that a little extra attention in the NVH department would eliminate almost entirely. 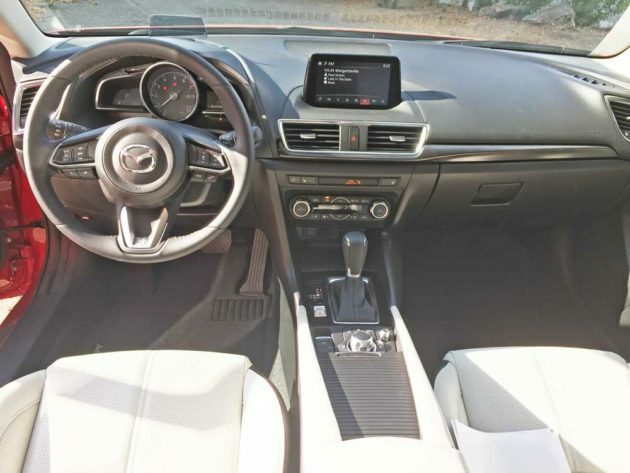 The MazdaConnect system is convenient with its center console mounted rotary knob and three buttons, which may be operated by feel without taking one?s eyes off the road, since the information appears on the dash mounted screen. The Head Up Display can be programmed to provide speed and other safety system warnings, along with the Navi system?s speed limit posting, which turns yellow when nearing excessive speed and displays red when actually accelerating above the posted limit. 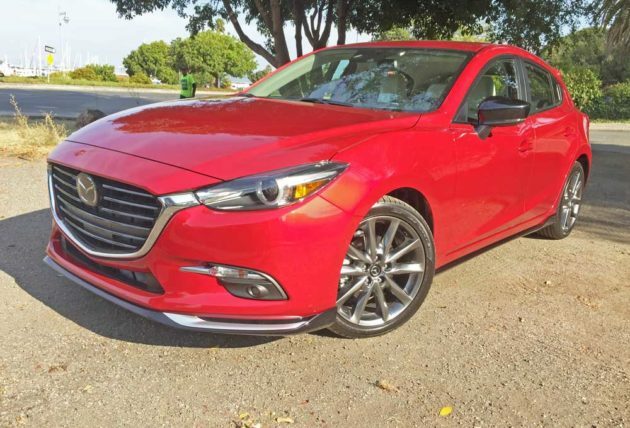 Bottom line, the 2018 Mazda3 Grand Touring 5-door, while competing with several vehicles in the same class and price range is a most impressive package at a reasonable price, especially considering the content and level of available technology. The pick of the litter, is the 5-door powered by the 2.5-liter engine in Grand Touring trim. The automatic transmission is fine, especially in Sport mode while the manual gearbox is more MX-5 Miata-like. In any case, there?s a 2017 Mazda3 vehicle available capable of satisfying nearly everyone?s needs. Engine Type and Size: SKYACTIV-G 2.5-liter, DOHC, 16-valve inline 4-cylinder with VVT and Direct Injection. Torque (ft./ lbs. ): 185 @ rpm Transmission: SKYACTIV Drive 6-speed automatic. Suspension: Front – Independent MacPherson strut with twin-tube shock absorbers. Rear – Independent Multi-link with twin-tube shock absorbers. Brakes:	Power-assisted four-wheel discs (vented front), ABS, EBD and BA. Tires: Yokohama Avid S34 – P215/50 R18 92V mounted on machine face 5-?V?-spoke alloy wheels with painted inners.